Date: 2.03.2018 | House, Trance, News | Tags: Future Sound of Egypt, FSOE, Paul Thomas, Umei, Skylex, Tim Verkruissen, Thomas Datt, The Thrillseekers, Aly and Fila, Daniel Kandi | Download Future Sound of Egypt 500 (2018) for free. Aly & Fila acclaimed Future Sound of Egypt radio show has reached the almighty milestone of 500 episodes. As is customary, the duo and the label have performed a sell-out world tour to their legions of fans from the United States to the Great Pyramids of Giza and beyond. To celebrate this spectacular feat, FSOE are releasing a compilation of 5 mixes to represent sounds from across their spectrum of labels. 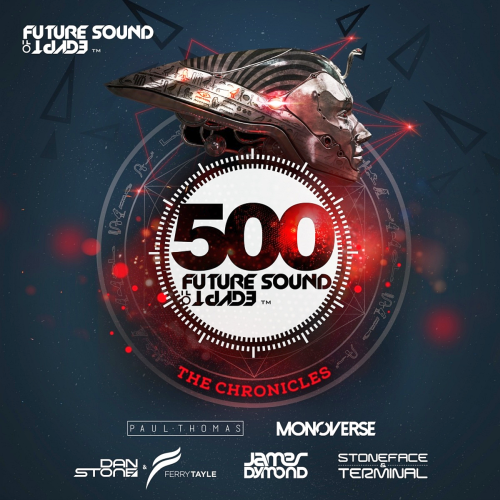 Monoverse follows with his favorite tracks in the progressive trance scene and showcases the sounds of his label FSOE Parallels. A pair of DJs that need no introduction, Ferry Tayle & Dan Stone provide the third mix of the series, offering a slice of their uplifting and melodic signings from FSOE Fables.